This unusual design makes a fun centrepiece for a Christmas tea table. Divide the icing into 3 equal pieces. Roll each into a 21 x 4cm sausage shape and cut in half lengthways to make 6 flat-bottomed crackers. Trim the ends with a sharp knife so they are straight and identical. Next, pinch the ends in 3cm from each end to form a cracker shape. Mark with a skewer to create a gathered effect and tie with ribbon. Place the crackers on top of the cake so they look as if they are in their box. 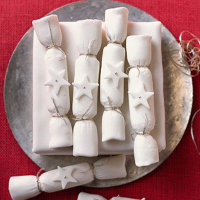 Re-roll any leftover icing and cut out stars to decorate the crackers.